Everyone loves a good barbeque in the summer. Barbeques themselves are great fun to light up for that matter. Cooking with live flame is a rare privilege that we don’t have in an indoor kitchen. 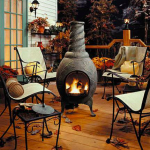 Chimineas have the added benefit of serving many purposes at once – grill, oven, and beautiful decorative centerpiece. All manner of wonderful, delicious things can be cooked in a chiminea. 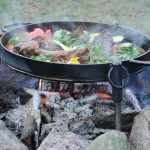 The inevitable companion of the live flame we so love to cook with in summer is smoke, which can have so much flavour to add to your food. 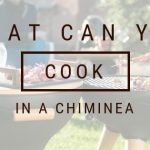 Why not kick it up a notch this summer and try using the chiminea as a smoker? To start off, the fuel will need to be arranged in such a configuration as to provide a long steady burn. 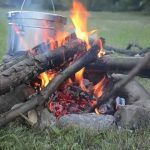 There are three main combinations of lit and unlit charcoal that are used to provide the indirect heat for a long cooking time. The first is a two-zone method, and a parallel configuration is usually recommended. All of the charcoal is lit at once and then piled on two sides of the chimineas basin. A foil pan with water is placed between the two piles, under the grill. 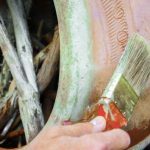 The second method is commonly referred to as a snake, since the unlit charcoal briquettes are placed in a line around the edge of the chiminea basin. One or two layers of briquettes are piled higher depending on how long you expect to be smoking. Wood chips or chunks are then added to the line of charcoal to provide the smoky flavours. A pan of water is again placed in the middle of the coals. A small pile of lit coals is added to one end of the line. A chimney is handy to use for lighting these briquettes before carefully using tongs to pile them in the chiminea. The lit charcoal will slowly burn down the line around the basin, lighting the wood to provide smoke as it goes. 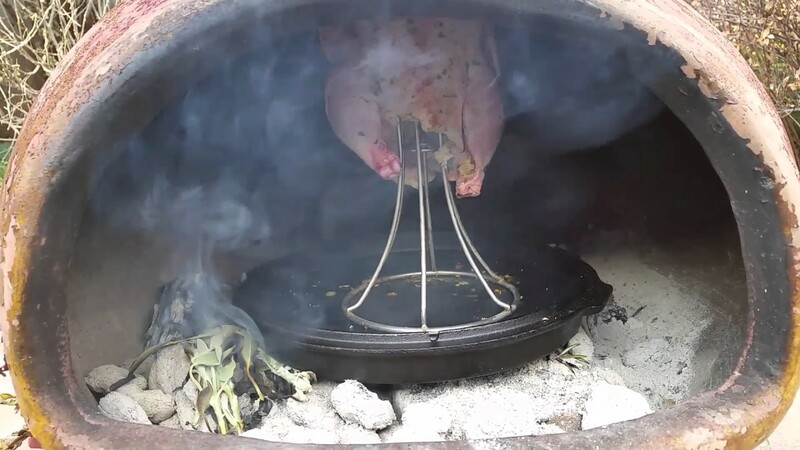 The third method for arranging the coals is quite simple and called the burn-down method. The basin is simply filled with unlit coals and some wood chunks. A few lighted coals are added to the top. Over time the lit coals will burn down the pile in the basin. This is ideal for long smoking sessions. The water basin is an essential part of the smoking set up. Water retains heat well and will serve to regulate the temperature to provide a good cook. Wood chips must be soaked for at least two hours prior to being added to the smoker or they will light and burn away too quickly. If wood chunks are being used then soaking is unnecessary, as they will burn a while on their own. Soaking the chunks will only increase the time required to light them and will increase the steam prior to smoking that they release. Keep in mind that two fuels require managing while smoking – the coals and oxygen. The coals provide the heat but the oxygen regulates how hot the coals can burn. Air is drawn in through the mouth of the chiminea and up through the chimney. This draught feeds the coals oxygen and brings the smoke up around the food. The ideal temperature range for smoking is around 225-250 degrees Fahrenheit. 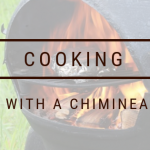 If the temperature is too high, closing off the top of the chimney some and partially covering the mouth of the chiminea will limit oxygen and reduce the temperature. 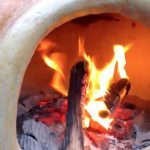 If the temperature is dropping too low, then opening up the mouth and top of the chiminea to allow for more oxygen will allow the coals to burn hotter. If the chiminea is already as open as possible then adding a few more lit briquettes can also quickly raise the temperature if needed. Use a barbeque temperature probe hung down from the top of the chimney to monitor the temperature and check it every hour to adjust as needed. While it is possible to smoke using solely wood, charcoal is usually recommended to maintain the long even heat required. 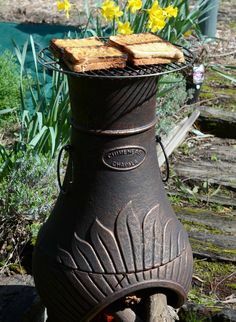 This means that cast chimineas in iron or steel are ideal for smoking and clay chimineas are not recommended. Various woods will lend different flavours to your food. The characteristically delicious smoky flavour comes from the phenolic chemicals that are released from the lignin in woods when the lignin is lit. All woods have lignin but only hard woods should be used for smoking food. Soft woods such as pine release an acrid toxic resin when lit that will add a terribly harsh flavour. Mild flavoured woods such as fruit woods (apple, cherry, pear, peach, etc.) and pecan wood are ideal for more delicately flavoured meats like chicken and fish. Hickory, oak, and maple have bolder flavours more suited to pork, beef, and lamb. Mesquite has the strongest flavour and as such is ideal for Texas brisket. Experiment with what woods are easily available and what combinations produce different flavours to find your preferred wood. Season and pre-marinate your food before smoking. Rubs are especially common for a good smoked pork shoulder for pulled pork. Dampened herbs can also be added to the smoker for extra flavour as desired. Instead of water in the foil pan, apple juice or beer could be substituted for a subtly different flavour as well. Respect what flavours are in play and don’t oversmoke the meat. Adding too much wood will easily overwhelm any other flavours present. 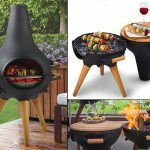 Once the coals are glowing a sullen red and the wood is no longer flaming but smoking cheerfully, the food can be added to the chiminea. Of course chicken, small cuts of pork, and beef are classic meats to smoke. Fish, vegetables, bacon, and other foods are also delicious smoked. Make sure the meat is cut small enough to fit inside your chiminea. Skewer the meat or place in a basket and hang from skewers or a grill set atop the chiminea’s chimney. If you wish to smoke a larger cut of meat such as a pork shoulder or beef brisket that will not fit in your chiminea, there are smoker attachments designed specifically for the chiminea available for purchase. 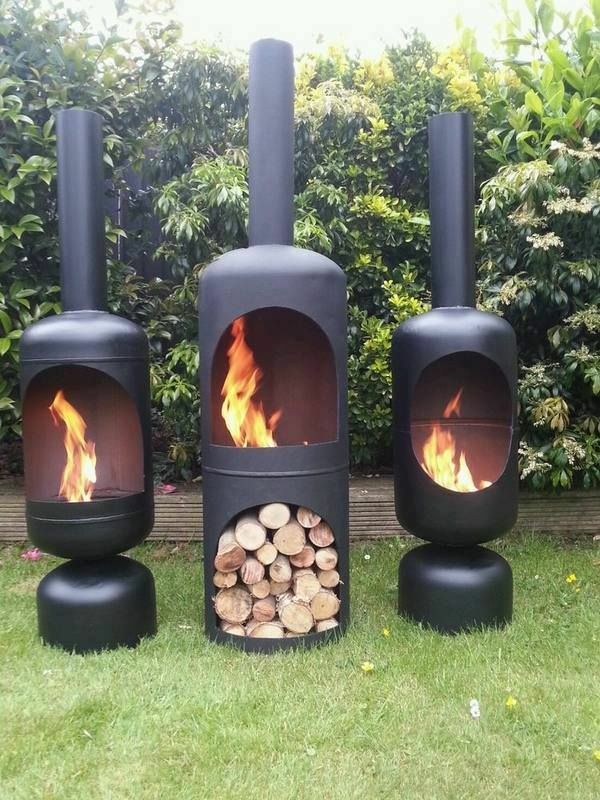 These smoker attachments are giant boxes with adjustable vents to control temperature that fit on top of the chiminea’s chimney. Remember that even though smoking is a long process you should never leave your chiminea unattended while lit. Have fun experimenting with flavour combination and smoking times this summer!